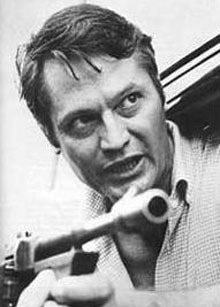 Hailed the “King of the B’s” and accredited most in recent times with kick-starting the careers of American directors Francis Ford Coppola, Martin Scorsese, John Sayles and many others, Corman gets forgotten as a director. He directed this crime film, a gangster movie, a “tabloid” picture. It stars Steve Cochran as gangster Joe Sante and follows his slow rise and inevitable descent in the world of organized crime. The dialogue is terse and hasn’t aged a day since it was written. The music enters the scenes sudden and jazzy. He uses quick, abrupt pans that seem awkward, almost amateur, but add to the roughness of the picture, like it was cut straight from the streets and not molded in the studio. 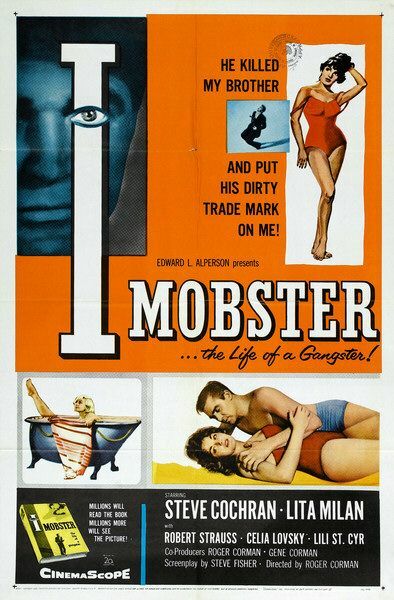 Tossed aside because it is cheap, I, Mobster stands with any gangster picture, towers over the morality infused coded studio classics Public Enemy and the forced macho of De Palma’s Scarface. Joe: Usually do it first and talk about it after. How did you find out? Frankie: I got a reputation for doing everything I’m asked. A man without nerves. Frankie: Maybe that’s why Paul asked me to do it. Joe: Even knowing how close we are. Frankie: Well, the way he explained it is, I step into your spot. He was pretty sure I wouldn’t be able to resist. Frankie: What do you think? Joe: The only thing I’m sorry about, Frankie, is that it has to be you. Joe: Yeah, I’m sorry about that too. Just as I was beginning to find out what I was born for, what it’s all about. But I guess that’s the way it goes. Frankie, see that she gets a decent break, will ya? Frankie: You know something, Joe? You got me all wrong. Better take care of Paul right away. Frankie: I’m not going soft. Whichever one dies, I’m in the same spot, number two boy, Mr. Anonymous, that’s good enough for me. Genres: a French word meaning category or type is our key to the kind of film that gives us the greatest pleasures. From time to time, we will be itemizing some of these films and their genres just for the fun of it. 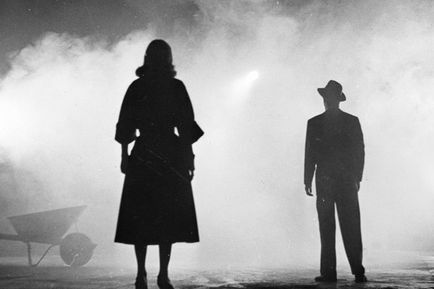 Among our favorites is the one referred to as Film Noir. Unfortunately, this term has become so corrupted that it is presently used to describe virtually any film that has some element of crime in its plot, but here is its classic definition. Film Noir. Literally it means black film, a generic term for a type of film set in a sordid urban atmosphere that deals with dark passions and violent crime. Many American thrillers of the 1940’s and 50’s were of this genre. -Characters whose basic natures are deceptive, cunning, dishonest, and downright criminal. -Violence and cold-blooded cruelty are very much part of the atmosphere. -Music, especially the blues and jazz, influence who the characters are, where they live, and how they behave. -Reversals and unexpected twists in the story and the events are common place. -Aspirations for a big payoff (in money from insurance, robbery, murder, etc.) fuels the ruthlessness of the characters’ behavior. -New and sudden alliances as well as betrayals, lies, and reversals in loyalty occur with dizzying swiftness among the characters of Film Noir. Roger Ebert probably put it best when he said, The difference between “a crime film” and a “noir film” is that the bad guys in a crime film know they are bad and want to be, while the noir hero thinks he’s a good guy who has been ambushed by life. We concur that Detour is probably the greatest noir film made, more about this later. The term “authentic American primitives” was coined by French New Wave filmmakers in admiration for their Hollywood heroes. Here we revive it and will occasionally write about American directors who paved a tradition in a country’s pictures. These films are not perfect in the typically sophisticated way of looking at art and literature. They are sophisticated in their own manner, by their own rules. When I think of the American tradition established by these directors, some of these words come to mind: crude, unfinished, cheap, robust, and like the French said, not only authentic but primitive. OPENING: A Norwegian whaler, come West to see his father, stomps the streets of the small town, its inhabitants follow timidly behind. He has nothing but a harpoon on his shoulder. 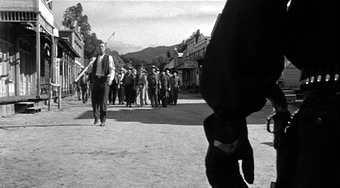 The camera picks up at the waist of a man in black clothes with two black guns. 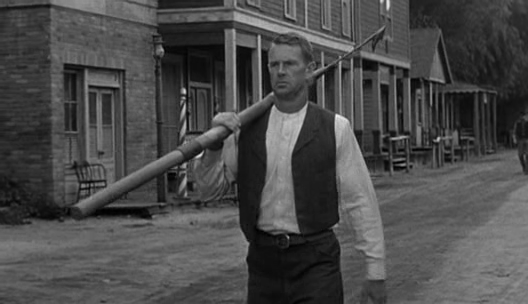 We follow him into the street where he and the whaler stand off. He asks the whaler if he’s close enough to throw the harpoon. The whaler says nothing. The gunfighter tells him to come closer. Character actors are another of cinemas unheralded heroes. Some acquire a small degree of fame or notoriety. But for the most part they go unrecognized and unremembered for the excellent work they’ve done and all the pleasure they’ve given us over the years. From time to time we will be highlighting some of these staples of the cinema whom we got to know nearly as well as we know the long time neighbor next door. Yet we don’t remember them until we see them in the next movie playing their next great role. 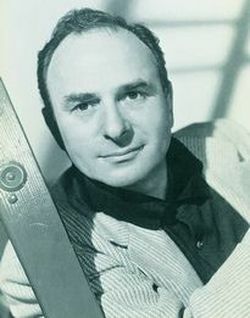 In his career Murray made more than 300 movies, acted in over 1000 TV shows and appeared in 16 Broadway shows. 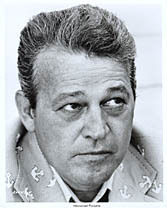 In each he played a prominent featured role. Some other significant films include: Anatomy of a Murder (1959) The Hustler (1961), and Brubaker (1980). He liked to quote one of his favorite directors Stuart Rosenberg (Cool Hand Luke – 1969)who always started every film he directed by saying to the cast and crew that he viewed life as a Department store and that the people who made films were working in the toy department. Murray subscribed to that view of things. He was a genuine Hollywood outsider because in spite of the high number of films he appeared in he never lived in California and was never part of the so called film colony. His best friends were Walter Matthau, Michael Parks, David Soul, Jason Robards, Peter O’Toole and George C. Scott. His favorite director was Steven Spielberg for whom he acted in Jaws (1975) and in 1941 (1979). Murray studied to be a graphic artist and got into acting by accident. He worked in the play Mister Roberts (1948) and later replaced David Wayne in the role of Ensign Pulver. As an actor Murray said that he always tried to first be “true to the part as it is written”, be “interesting in the role” and “serve the director to the best of my ability”. He was born in North Carolina and died there 62 years later of cancer. Murray was one of the best of the unheralded character actors and it would be a shame if his contributions to the films in which he appeared were forgotten. He’s not forgotten here. Thank you, Murray, you were wonderful. He was a movie star in the full sense of the phrase. A special presence that graced the screen all too briefly then vanished from the scene never to be seen again. I’m not talking about the chronological length of his career in films which lasted eighteen years from 1948 to 1966. 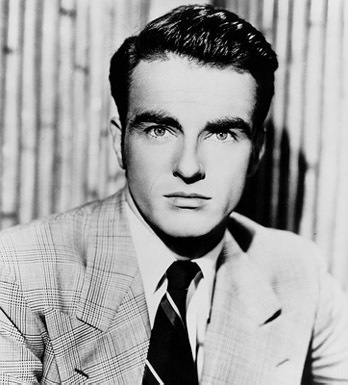 I’m talking about the period from 1948 to 1953 when he starred in three landmark films Red River (1948), A Place in the Sun (1951) and From Here to Eternity (1953), giving award caliber performances in each. But what distinguishes them even more is his unusual presence. Quiet, unobtrusive, hesitant, and almost apologetic yet at the same time beautiful and poetic. And he was. What that was we’ll never know. Clift during this period was mysterious, moody, fascinating and magnetic. You couldn’t keep your eyes off him. Then came the auto accident that destroyed his face and apparently destroyed something else as well. His angelic inner persona that shined so brightly through the roles he played. He was to give other good performances, even other award caliber performances but he was never the same. His career and his life after the accident has been called “the longest suicide in Hollywood” and accurately so. But fortunately for us we have those early years and that special presence forever captured on film where he will remain immortal as long as motion pictures exists. 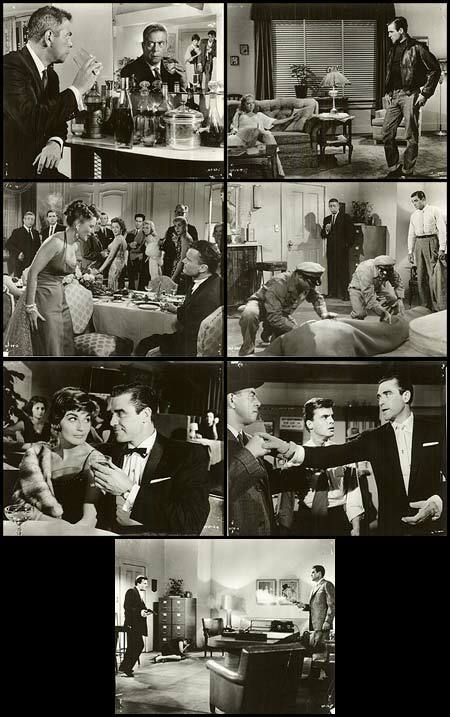 The Search (1948), The Heiress (1949), The Big Lift (1950) I Confess (1951) and Indiscretion of an American Wife (1953). I highly recommend them all.